The Government’s White Paper, Success as a Knowledge Economy, views Higher Education as if it were nothing more than an investment in human capital and a contributor to economic growth. It accepts that current universities are world-leading in teaching and research but then falsely asserts there is a problem of quality! The solution to this non-existent problem, the Government claims, is to open the sector to private for-profit teaching providers. The proposed unitary ‘Office for Students’ is little more than an agency to ensure market competition. Ofstud is not intended to support students, but rather to enable private providers to have access to high tuition fees, to be staffed by board members with ‘the experience of fostering choice and competition, and of robust financial control’. Students are supposedly ‘at the heart of the system’, yet the quality regime proposed – the Teaching Excellence Framework – includes no direct measures of teaching quality. Rather it is designed to facilitate increases in fees, with the possibility of a more radical lifting of the fee cap in the future once the new arrangements are established. The Government claims these arrangements will maintain quality in higher education, but the history of for-profit higher education is littered with poor student outcomes, and with spending more on marketing and profit-sharing than on instruction. For-profits are able to do this precisely because they are ‘unbundled’ institutions relieved – now by proposed Government legislation on degree-awarding powers and the title of university – of the wider functions of a university. Vice Chancellors have gone along with the conversion of public funding of higher education into a debt-fee model of funding to maintain their revenues. 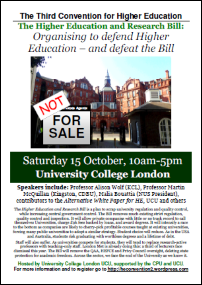 This was always a bargain struck against the interest of students, but now the very idea of a university is at stake. We call upon our colleagues and the wider public to speak out to put the values of a university, of academic freedom and of genuine quality education for all who can benefit, where these values belong: at the heart of the system. 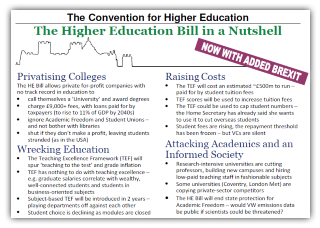 Our vision, published as an Alternative White Paper for HE, will be published very shortly.